To change the image pages file name go to the Options step, the Image pages tab and click the ... button in the Page file name template section. It opens the file name template editor window. You can name all your image pages using the file name of its full-size image. Simply check the Use image file name box. 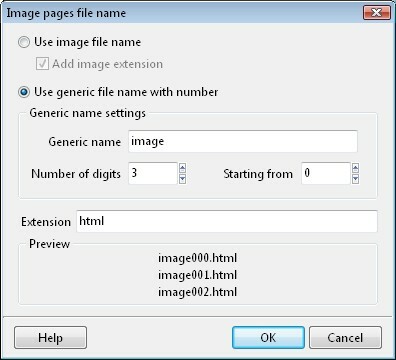 The resulting page file name will have the name of the image file plus the extension you enter into the Extension box. For example: photo1.jpg.html (for the photo1.jpg image file). If you do not want to add the image file extension to the page file name, then clear the Add image extension box and result will be the following: photo1.html (for the photo1.jpg image file). Another choice is to use the generic file name for all image pages. Simply enter the generic part of the file name into the Generic name edit field, specify how many digits you want in the added number in the Number of digits field and the value of the first added number in the Starting from field. Change the default extension if you want in the Extension field and your new image page file name template is ready.